Chocolate and peanut butter, what more could you possibly want? How about making it a high protein cupcake and then you will be speaking my language! 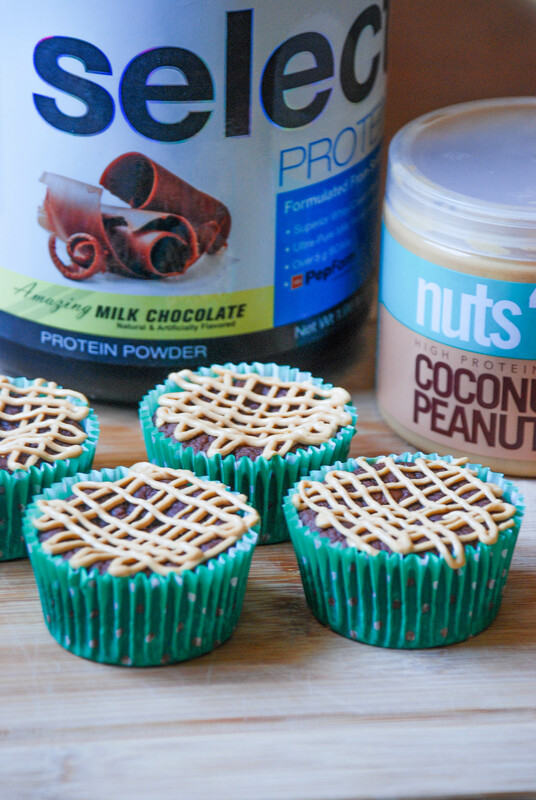 I used my favorite Milk Chocolate Protein Powder from PEScience Select Protein and topped my cupcakes with a Nuts ‘N More Coconut Peanut Butter crosshatch. By the way, if you are a peanut butter connoisseur then you will absolutely love Nuts ‘N More. It’s so creamy and delicious, I just can’t even begin to explain to you the goodness that is Nuts ‘N More. Pre-Heat oven to 350f and prepare a cupcake pan with cupcake liners. Mix all dry ingredients together and then add wet. Divide cupcake mix up between 6-8 cupcake liners. Bake for 19-21 minutes or until a toothpick comes out clean. Once cooled, place peanut butter in a piping bag or Ziploc bag and snip the corner. Createcross hatch. Love these recipes? Subscibe by email! Love these recipes? Leave your email and subscribe today!